This article is about the year 457. For other uses, see 457 (disambiguation). Year 457 (CDLVII) was a common year starting on Tuesday (link will display the full calendar) of the Julian calendar. At the time, it was known as the Year of the Consulship of Constantinus and Rufus (or, less frequently, year 1210 Ab urbe condita). The denomination 457 for this year has been used since the early medieval period, when the Anno Domini calendar era became the prevalent method in Europe for naming years. January 27 – Emperor Marcian dies at Constantinople, possibly of foot gangrene, an infection contracted during a long religious journey. He is buried in the Church of the Holy Apostles, together with his late wife Pulcheria. February 7 – Leo I, a Thraco-Roman (or Dacian) high-ranking officer, becomes the new emperor of the Eastern Roman Empire, reigning for nearly 20 years. He is first to accept the Byzantine crown from the hands of the patriarch of Constantinople. April 1 – Majorian is acclaimed emperor by the Roman army, after defeating 900 Alemanni near Lake Maggiore (Italy). 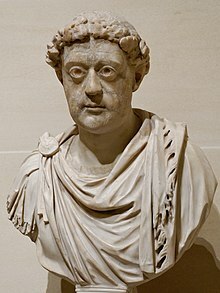 December 28 – Majorian is crowned emperor of the Western Roman Empire and recognized by pope Leo I. His rule is accepted in Italy, Dalmatia and some territories in Northern Gaul. Childeric I succeeds his father Merovech as king of the Salian Franks. He establishes his capital at Tournai (modern Belgium) and becomes a foederatus (pl. foederati) of the Western Roman Empire. According to the Anglo-Saxon Chronicle, 4,000 Britons are slain at Crecganford in battle against Hengist and his son Oisc of Kent. Yazdegerd II dies after a 19-year reign. He is succeeded by his son Hormizd III who seizes the Persian throne. His elder brother Peroz I rebels against him in Sistan (Iran). After months of civil war he defeats Hormizd and becomes the seventeenth Sasanian king of the Persian Empire. Victorius of Aquitaine computes new tables for celebrating Easter.